Mark Horgancamp in the rural upstate New York is a cross btwn Robert Crumb and Henry Darger, but more personable and less creepy than the two. After severely beaten and left brain damaged outside a local bar, Hogancamp lost his past memories. He only can remember bits and pieces from his belongings and photographs. He was a raging alcoholic and once married to an attractive blond and if his cryptic drawings were any evidence, was a very talented artist. Since his hands are not steady enough to draw anymore, he starts building an elaborate Belgian WWII town named Marwencol filled with figurines of GIs, Nazi officers and barbie dolls. There he projects his fantasies and anger through his alter-ego(a GI doll with a mean scar on his face who owns a bar) and populate the town with dolls named after real people around him. He develops countless war scenarios, takes photographs and documents the on-going dramas of his makeshift Belgian town in his backyard. Malmberg's documentary is tender and intimate. Horgancamp is never treated or seen as a freak but a genuine folk artist with great imagination. Discovered by a local photographer by chance, Hogancamp gets to share his world with the rest of the world in a gallery show in New York City while we get to learn the reason behind the attack on him. After the beating, even though alcohol doesn't have a hold on him anymore, certain things that makes him himself didn't change. It's really great for me to see a creative person at work on screen. It really soothes me. 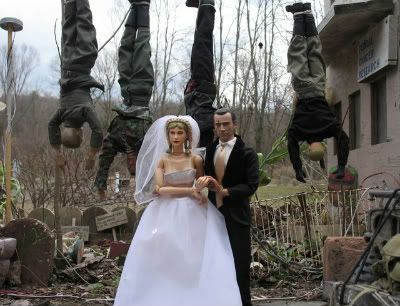 There is an exhibition of Horgancamp's photos of Marwencol at Esopus Space in New York City, a block down from my job. If you are around the area, please check it out.